Course participants, from (L-R): Len Gafem, Nigel Tahija, Kaiomen Kens Ningin and Elish Peono. 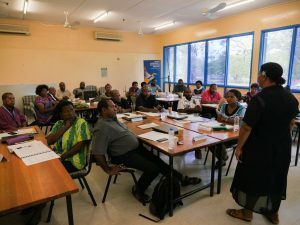 Twenty-five public servants from 12 provincial administrations and health authorities in the country have completed the first ever Future Leaders Program through the Pacific Leadership and Governance Precinct. The Future Leaders Program is focused on the development of public servants’ professional skills, leadership capabilities, strategic thinking and policy development. 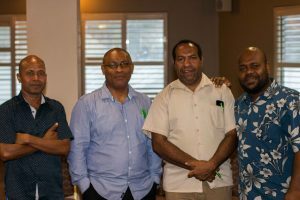 The first cohort began in March and participants travelled to Port Moresby three times for intensive two-week blocks at the Papua New Guinea Institute of Public Administration (PNGIPA). The Future Leaders Program is delivered as a collaboration between PNGIPA, the University of Papua New Guinea’s School of Business and Public Policy and the University of Queensland with guidance from the Department of Personnel Management as part of the Papua New Guinea-Australia partnership. Future Leaders Program Cohort 1 participants discuss gender in the workplace. Grace Garu, Finance Manager at the Southern Highlands Provincial Health Authority, said the Future Leaders Program motivated her to go beyond the core duties of her role. “This course is about leadership. I was already a manager but I worked within my confined zones,” she said. “The Future Leaders Program has broadened my vision – being a leader means to lead others in making effective changes and to be a role model. Kaiomen Kens Ningin was promoted to the position of Acting Human Resources Manager at the Western Provincial Administration just as he commenced the Future Leaders Program in March. Grace Garu (right) and her colleague Elizabeth Brian (left) from the South Highlands Provincial Health Authority. “Without this course, given the responsibility of Acting HR Manager, maybe I would be sitting there thinking ‘how will I go about it?’” Mr Ningin said. “I’m a manager, I’m a leader and this program is making me think and take responsibility in that role. 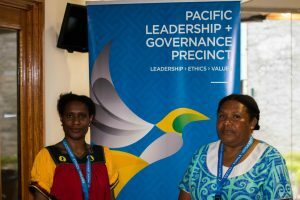 The Pacific Leadership and Governance Precinct is a partnership between the Governments of Papua New Guinea and Australia to support the development of ethical, capable public sector leaders.